In the quest to improve myself as a skier, I've read and watched many shelves of books and DVDs with hundreds of hours of instruction material and skiing at all levels, from beginner to expert. I was exposed to several different ski instruction systems and schools of thought. I interacted with many instructors, coaches, athletes, racers and skiers of all levels. I have spent thousands of hours practicing, thinking and analyzing, trying to reconcile the multitude of ideas about expert skiing: both on how to ski and on how to teach skiing. I tried most of them myself. I spent many seasons putting into practice and testing my understanding with fellow coaches and athletes. Progress came somewhat slowly and very unevenly. There were A-HA moments, true turning points where progress was massive following a discovery or a boost in understanding. And then there was hard, tedious work. But also lots of fun, as I confess: I often tend to get too caught up in the joy of skiing, to remember to work at it! This is the website I wish was available when me and my kids started getting into skiing and racing. Enjoy! There are many ski books and ski coaches out there, useful from absolute beginners to experts, many schools of thought and everything in between. Thinking back to my own evolution, one ski book is never enough. This or that system has its own limitations and I had much better chances at understanding specifics the more books I was reading, as long as I paid attention and filtered out the chaff. 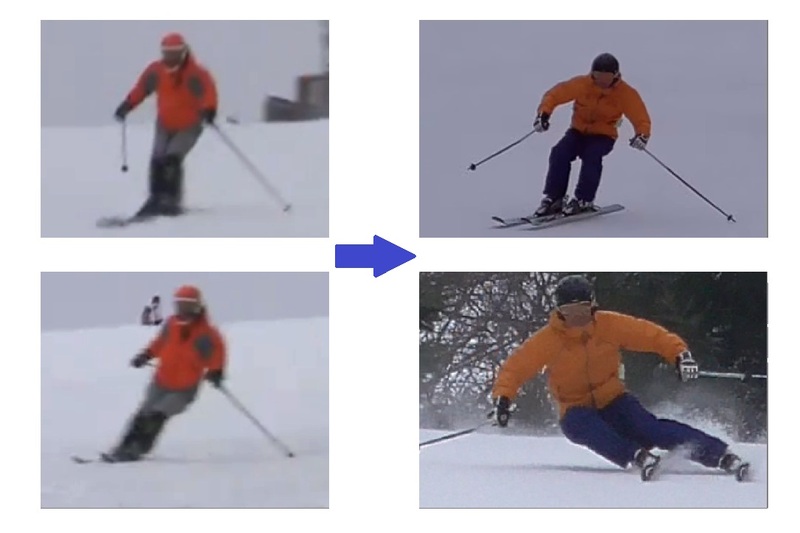 "Knees to skis", "close ankles", "pressure the shins", "feel the front of the boot", "pressure on the ball of the foot", "dorsiflexion", "move hips forward", "pull the skis back" are just some of the ways to "get forward" for instance, each with its own little sub-universe of clues, cues and imagery. Some trigger movement patterns that are more effective than others while some may be more applicable in certain situations. I found it better to have more descriptions of a certain movement than less. More points of view and correlation to more cues and feelings. So we'll keep coming back over the same fundamentals of skiing, but often looking at them in a different light. Looking back, the more I understood and felt, simple instructions I heard many times before, started to take on new meanings, to become a lot more logical and applicable to my skiing. My brain or my body started to figure out new ways to apply and combine them and lead to many small advancements and A-HA moments. We aim to do the same here: provide you not only with the best ski techniques and learning ideas, but with new connections, new descriptions and hopefully help your understanding grow, as does ours. Although great skiing doesn't change much with equipment or the times, as we evolve as skiers, there's always something to learn: new techniques, refinements, misunderstandings etc. If you are a ski DIY-er like I was/am, this is the site for you. We've been there and done that and this is your guide, from beginner to expert skier, molded after our collective evolution and we'll help you along, no worries. Go through the progressions here and you're guaranteed to learn something. Or to teach us something: we're always open to ideas for improvements. We have many kids that start ski racing from a variety of levels of skill and ski experience and they usually get allocated to an age group and a coach that now is faced with teaching a wide range of skill. It is really hard to bring the new ones up to speed and honestly, very detrimental to their development to be bundled with other experienced racers just because they share the same age. If you have kids that think about racing, this website is for you. Work through these progressions with your kids, before or during their race training, to develop their skiing. While round turns are slow, great technique is a must for any racer! Modern learning theory holds that, given the way the brain learns things, we cannot change the way we do complex movement patterns directly. So, if we have some bad habits in our skiing, it's not easy to actually change them, in a sense. The most effective way is to decompose the movement pattern into small components, learn the new ways to execute one component, replace the old with the new and re-compose back the larger sequence. The basic idea is replacing the old with the new as opposed to fixing the old. Read Promoting new movement patterns for more details. Viewed 1365 times ( | Print ) this page.